Successfully Added Formula 1 RC Race Car - Deluxe F1 Racing Car (220V) to your Shopping Cart. Formula one race car with back-end suspension for optimum performance. 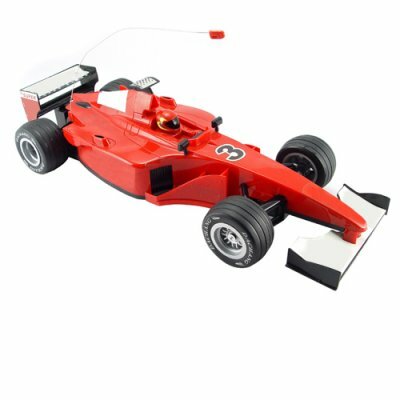 This deluxe F1 profile looking smooth riding radio control (RC) racing car will allow you and your little loved ones to imitate all your favorite F1 champion drivers. This model comes with no default markings on the RC car body, it has been especially left for you to place your own custom made art work or stickers. Create your brands and style of new F1 RC race car. The formula one RC car is designed to work on smooth surfaces, and is supported with back-end spring suspension and adjustable wheel alignment to help the car move more flawlessly and smoothly. The RC formula one car is realistic looking and also makes a great monumental piece to display on your shelf. The wheels are made of rubber and the body is made of high quality molded plastic. This makes a really great gift for any occasion, especially for formula one fans. As always, this wonderful new RC product is offered to you at a factory direct low wholesale price. From the leader in direct from China electronic products, Chinavasion. F1 racing car with back-end suspension and front wheel alignment. Can drift and go fast, and perform a 180 degree turn on smooth surface's. The default charger for this product is for (220V) AC adapter. Don't miss this opportunity to buy great RC toys from Chinavasion, these would make great gifts for anyone! Can this RC F1 car be used outdoors? Yes. Can it be used outdoors after it has rained? It is not advisable as some water may get into the circuit system and damage the F1 RC car. What is the wheel adjustment for? The wheel adjustment will help you straighten the front wheels, as time can cause wear and tear. This way you get much more longer use out of this durable and amazing F1 RC toy car for years to come.